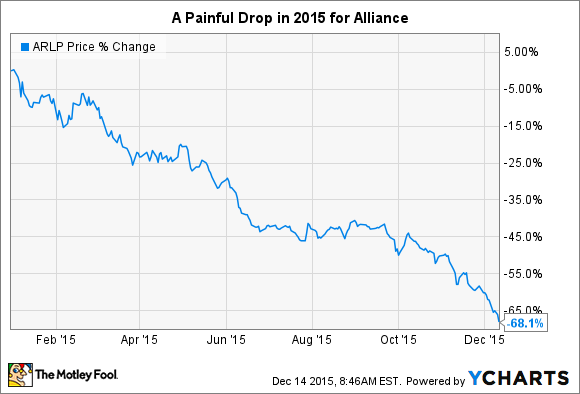 Alliance has long bucked the coal industry's downtrend -- and in 2015, it used that trend to get stronger. When Alliance Resource Partners LP (NASDAQ:ARLP) investors look back on 2015, it will be remembered for the partnership's massive price collapse after so many years of bucking the coal industry's downtrend. But that misses some good news hidden underneath the painful drop. It would be easy for investors in coal-related stocks to want to forget 2015. Giant miners like Alpha Natural Resources succumbed to bankruptcy. There are legitimate concerns that others, like Peabody Energy (NYSE:BTU), could be next. That's after often-massive production cuts and material cost-cutting. For example, Peabody produced roughly 8% less coal through the first nine months of the year and trimmed its capital spending by nearly 40% year over year in the third quarter. But Alliance is in a different camp. It actually increased its production about half a percent through the first nine months of the year and unlike most of its peers, turned a profit. Lower coal prices did hurt the bottom line, but there was still plenty of cash flow to cover the partnership's distribution. This is the strength on which the company's best move in 2015 is based. So while other miners have been trying to simply survive, Alliance has been doing reasonably well operationally. Since it can't control coal prices, that's really the most you can ask. That said, this operational strength coupled with its strong finances has left Alliance in a different position than its peers. It used the continued decline in 2015 to acquire sole ownership of a key asset, the White Oak mine. The cost was $50 million. However, Alliance believes that owning 100% of this mine will allow it to trim costs by as much as $18 million a year at the mine. So there's some potentially huge synergies. The White Oak mine is a world-class, low-cost longwall operation with an extensive reserve base. It will be an attractive addition to our asset portfolio and provide ARLP increased flexibility to service our existing customer base and the opportunity to expand into additional markets. In the near term, White Oak gives us greater optionality to optimize our production to current market conditions. Longer term, the ability to add a second longwall at White Oak gives us an additional platform to increase our coal volumes should market conditions allow. The White Oak Mine. Image source: Alliance Resource Partners. In other words, Alliance just solidified its position in its key operating region, the Illinois Basin, with a deal that will benefit it today in some ways and give it enhanced growth opportunities in the future. To be fair, White Oak was, going in, expected to be a drag on results in 2015 as the asset was integrated. So this deal will make 2015 look worse than it already is. But it shows Alliance's strength as a business and its ability to opportunistically use a downturn to get better. That's the hallmark of a great company. Still, it's tough to love a coal miner. It's even tougher to love a partnership that's seen its units fall so far so fast. But Alliance Resource Partners really is the cleanest shirt in a dirty industry. And while the hefty 19% yield might scare you, Alliance covered that distribution by 1.66 times in the third quarter. That gives this conservatively run partnership some wiggle room to keep paying investors while it works through -- and gets stronger during -- coal's slump. And buying 100% ownership of White Oak is proof that Alliance is not only strong, but getting stronger.